Using the names of animals that start with letters in the alphabet in rhyme, making each story silly and easy to remember the alphabet. With distinct animal characters — some already familiar to readers, others new — and fun-filled, vibrant illustrations, the book will readily engage children’s interest while using rhyme to teach them the alphabet. Each animal character is presented as playful, and has a unique personality that can be discovered throughout the book. OMG. These illustration are awesome. Very pleasing to the eyes and will make people go out and purchase the book(s). 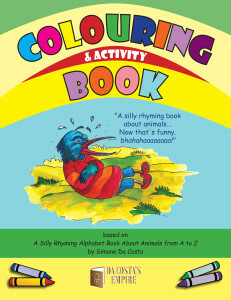 Da Costa’s children’s book, “A Silly Rhyming Alphabet Book about Animals from A to Z” is a delight for children and parents. In every sense, it is an instructional book but one which is cleverly disguised as a rhyming, animal book. While reading this book, children will unknowingly learn the alphabet, be introduced to animals new and known, and pick up the subtleties of rhyme. The author presents short stories for every letter of the alphabet and the featured characters are animals. This makes the reading experience fun by giving parents the opportunity to sing, act out, and improvise, while encouraging children to do the same and thereby open their own creative channel. The creativity of this work is displayed in the unnatural environments the animals live in and in the actions the animals undertake. Animals driving cars, ironing, escaping the zoo…it is all way too much imaginative fun! Supporting the stories are illustrations that quite literally make one smile. They are superb–colorful, detailed and diverse. I enjoyed them immensely. And just in case parents want to “test” their little one’s comprehension and listening skills, there’s a quiz at the back of the book which can be used for such. The pressure of teaching a child the alphabet is lessened with this beautifully crafted and designed story book for children…and parents. 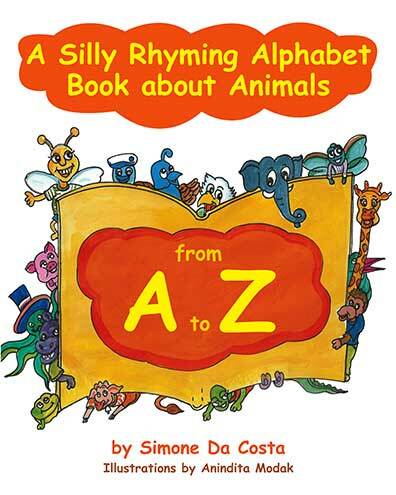 “A Silly Rhyming Alphabet Book about Animals from A to Z” by Simone Da Costa is a colourful introduction to the letters A – Z. Brightly illustrated animals take you on their personal journey, as they connect with every reader. The rhyming is delightful with each letter, portraying an animal that is either laughing or showing a scene where they are happy with themselves and life around them. This book offers a fun feel while interacting and engaging with children and their parents. Ever letter is uniquely different; each carries a message of caring and love. This is a delightful book to entertain and educate our young with a moralistic outlook. VERY GOOD: The characteristics of a 4 heart book include: a great story; I loved the characters; and there was an interesting plot and unique story elements; there may have been a few odd things kept the story from being amazing. humor, and rhyming geared to teach young children their alphabets. I think this is a book that children would enjoy pulling from their bookshelves time and time again. I highly recommend the book to parents of children between the ages of 3 to 5 years old. A wonderful learning tool. A Silly Rhyming Alphabet Book about Animals from A to Z” is a refreshing new twist on the skill of rhyming. Its catchy rhythm is original and very fun. The illustrations will grab the attention of little ones of all ages. I highly recommend A Silly Rhyming Alphabet Book not only to teach, but for the simple pleasure of childhood reading. Thank you for reading my book and telling me what you thought of it. I really appreciate it. To answer your questions. It says in the book why the Lion is crying, but I will tell you why she is crying. She is crying because she has lots of ironing to do and she does not like to iron, so she’d rather go back to live in the Zoo instead of ironing. As for June Bugs, they come in the months of May to July, not only June. I read your book and I like the Pig, Nightingale and the Zebra. I do not like the “X” word. Why is the Lion crying and does June Bugs come in June? We earnestly enjoyed reading your book. Overall, it was an excellent read, the kids enjoyed reading it a great deal; they were fascinated with the character ‘Iguana’ and couldn’t get enough of him. The illustration was amazing and eye catching as well. I was extremely thrilled with the quiz; it served as a good brain exercise for the kids as it tests their knowledge about the book. Looking forward to reading more from you in the near future… Kudos! I like the Upupa, Lion and my favourite is the Iguana, he is funny. Simone Da Costa’s latest illustrated children’s book, A Silly Rhyming Alphabet Book, is a joy! 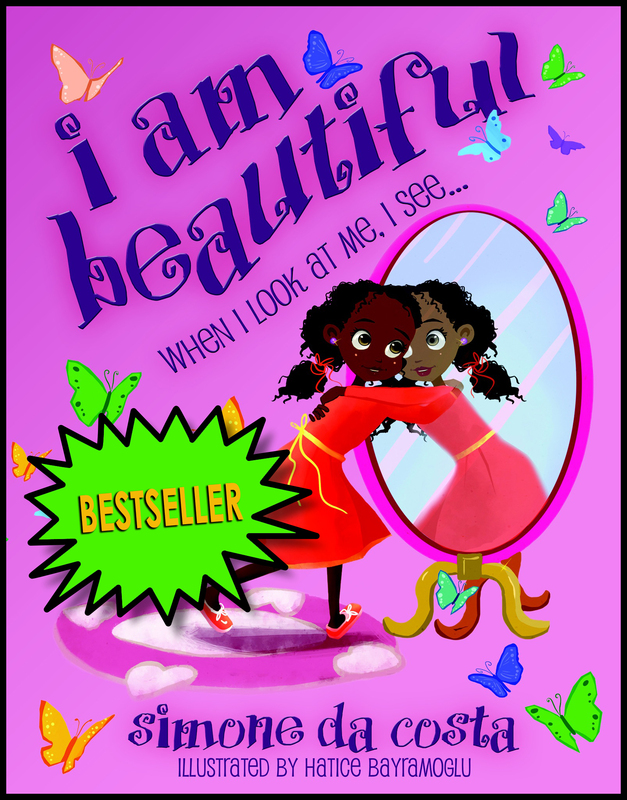 An ideal primer for children learning language, the book is certain to enthrall young readers with its catchy verse and bright, colourful illustrations. As the title implies, the text is presented as a series of rhyming verses with each page featuring a different letter of the alphabet. In turn, these letters are represented by featured animals, spanning A for Ape to Z for Zebra. A handy review and quiz are also included to help parents and educators determine comprehension levels. A Silly Rhyming Alphabet Book has an enchanting aesthetic. Its strong, vibrant colours, lively illustrations, memorable animal characters and easy-to-read format makes A Silly Rhyming Alphabet Book a delightful addition to any children’s library. I like the Iguana and I like the Koala because she yells, “Yoo-hooooooo.” And I like the Lion because she wants to go back to the Zoo. I liked the pictures and the stories they were very funny. Between the Lines Blog Tours presents A Silly Rhyming Alphabet Book About Animals by Simone Da Costa. I had the pleasure of reading an advance review copy of the book, and though my children are all grown, I think they would have enjoyed it when they were younger. The rhymes are definitely silly and the illustrations are fun. 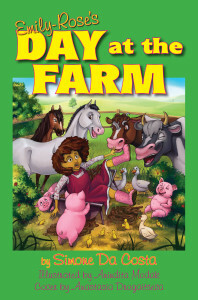 The author is very inventive in the way she portrays animals we don’t ordinarily meet in a book for children. So many of the alphabet books on the market use the same words to represent each letter, but Da Costa uses her creativity to help kids think outside the box. I think my favorite part of this book is the quiz at the end. Parents will be able to read the book to both toddlers and older preschoolers. While toddlers will enjoy the pictures, the preschoolers will enjoy the silly rhyming tales and the quiz at the end. I like the pictures and the characters. “A Silly Rhyming Alphabet Book about Animals” is bound to capture the interest of its young reading audience. It is an absolute delight! Starting off with Dape the Ape…the children are introduced to a variety of birds and animals starting with each letter of the alphabet. 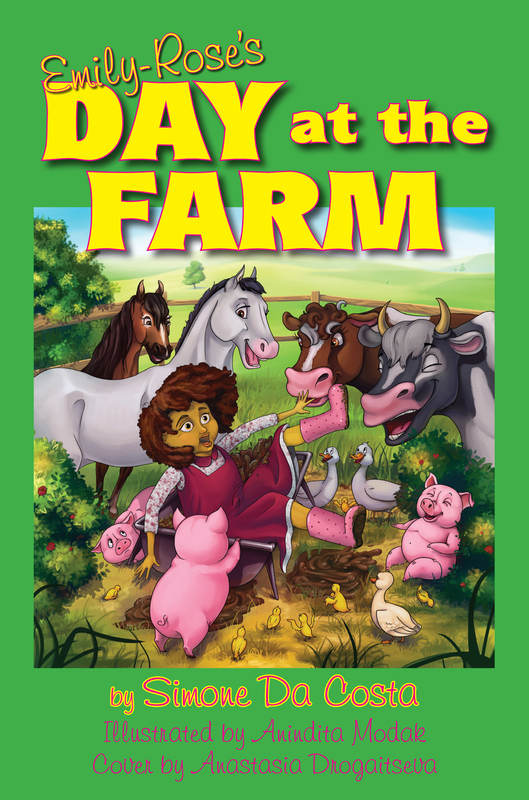 The author’s use of rhyme and silly events make this children’s book a memorable experience. It fondly reminds me of several of the Dr. Seuss books I used to read to my children when they were young. It’s wonderful to experience a childlike learning experience and the different methods that one can creatively use to teach children the ABC’s. The colorful characters such a Jerry the June Bug, Vole and his mother Sole, his father Tole, and his three brothers Joel, Coel and Dole add to this educational opportunity. The vibrant illustrations created by Anindita Modak are sure to enhance the reading pleasure and bring even more joy when reading this book to young children. 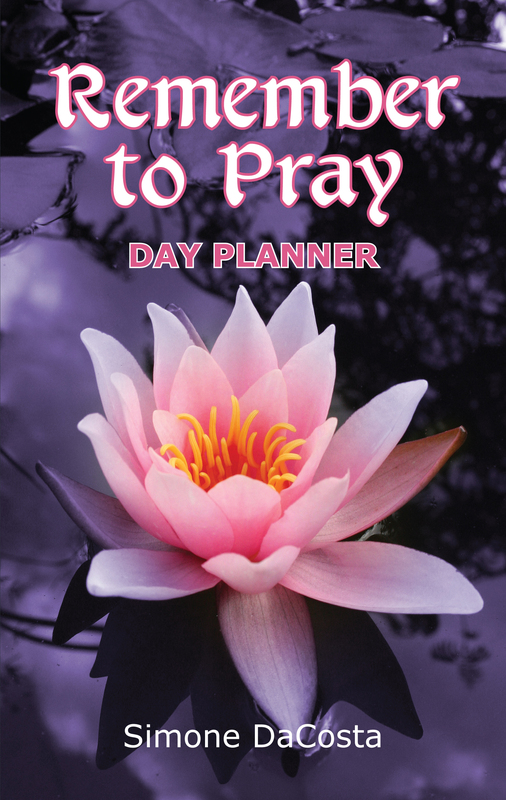 I have several grandchildren and I definitely plan on sharing it with the younger ones. Also, as a former primary school teacher, I am always eager to read children’s books. Learning is meant to be a positive experience and this delightful book certainly demonstrates this fact! The added bonus of the Quiz at the end of the book further enhances the opportunity for children to remember some of the information being provided. Good stuff! Although my grandson is only 2 years old he just loves the bright pictures… I read it to him on a regular basis and he enjoys the book tremendously. It is a great learning tool and, I am sure it will be one of his favourites as he grows older. I think it is a lovely, charming book and, I especially like the test at the end of the book. That is a great idea….different. Another stellar review of my children’s book by David Wilson. 5.0 out of 5 stars Adorable, hilarious, and fun, July 11, 2013. “A Silly Rhyming Alphabet Book About Animals” is a fun and educational exploration of the alphabet and word rhyming. “M is for Monkey, who dresses very funky. ‘Yeah, man, I look very spunky…” and Dale the Quail who waits for his mail are but two of the classic critters representing their letters, all of which continue with more wordplay to keep you smiling before they’re done. And of course there are twenty-four more letters and their adorable critters! I/’am very pleased to announce that the September 2013 issue of our online book review magazine \’Children\’s Bookwatch\”features a review of\”A Silly Rhyming Alphabet Book About Animals From A to Z\”. After reading all 26 silly stories, there is A to Z Quiz Time, Do You Mind? Here are 10 multiple choice questions to help young children remember details of each silly animal\’s story, with quiz answers at the bottom. Children ages 3-6 will love this unusual alphabet story book with its unforgettable animals and bright, silly pictures.